The Minister for House has announced his intention to lift restrictions on building heights in city cores & along key transport hubs in an effort to increase density in our cities and prevent urban sprawl. It is hoped that such amendments to the current height restrictions will be announced before year end. Any such changes would mean amending the DCC Development Plan. The current permitted areas are too restrictive. Demographic trends show that the population is growing and becoming more and more urban. Taller and therefore larger apartment schemes will appeal to investors and help fill the gap for rental properties. While the removal of height restrictions is to be welcomed, it does not address the fact that higher apartment blocks involve increased construction costs and are a bigger risk. The whole apartment block needs to be built and finished in one go. Housing estates are more cash flow friendly in that their construction can be phased which helps gauge demand, pricing and the sales proceeds can help fund later phases. 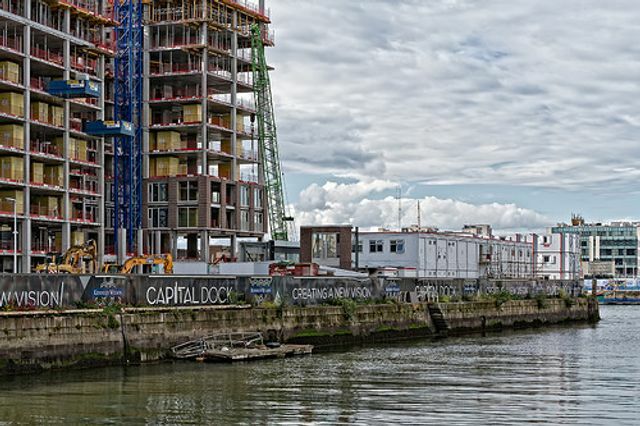 The SCSI’s recent report on housing costs shows that the cost of constructing apartments remains economically unviable. The report shows that the cost of building medium rise apartments (6 – 8 stories) costs an average of €578K per unit as opposed to low rise apartments at €470K per unit (3 stories). At these prices, only the top 20% of earners can currently afford the least expensive type of apartment costed in the report. The three main costs are the site purchase cost (16%), construction costs (43%) and soft costs (41%) (e.g. finance costs, VAT on sales, development contributions etc). Site acquisition costs range from €33k to €125K per unit depending on location and scheme size. Build cost for a 2-bed apartment varies from €155K to €255K (ex. VAT) depending on the design and car parking requirements of an apartment. Apartment build costs go up depending on their design and car parking requirements. Currently planning will only be granted for an apartment scheme if there is one car park space per unit. It appears from the report that build costs cannot be offset by the revenue generated by bring such units to the market. The costs of apartment construction need to be reduced urgently. The report suggests that solutions to this include increasing supply of serviced land, more innovative apartment design, revising design guidance and car parking ratios, extending the development contribution rebate scheme, cheaper development finance perhaps to be introduced via a state finance agency for housing projects or increasing ISIF funds, temporary reduction on VAT, include build to rent in the design guidelines. Solutions are needed to make the cost of apartments viable as without them, the amendment of height restrictions will be futile and more residential units are needed sooner rather than later. While apartment values increase, the higher up in the building they are, building costs don't increase in a linear way, and the economics of development move in stages, as foundations and frames have to be upsized. Build high and zone outwards - possible solutions to housing shortage? Is shared accommodation the housing Minister's eureka moment? Help To Buy Scheme for the chop?